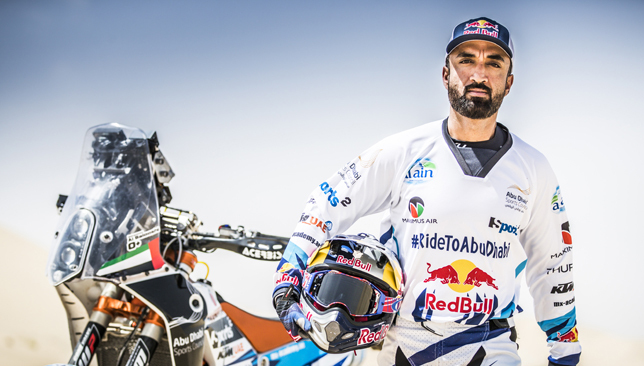 Mohammed Al Balooshi has revealed all about the ferocious accident that knocked him unconscious during the Abu Dhabi Desert Challenge, declaring he woke up thinking it was 2016. The Emirati motocross rider saw his hopes of winning the competition end in an unfortunate manner after crashing near the end of the 281km Al Ain Water Stage in the Liwa Desert on Tuesday. The impact of the incident meant the 38-year-old had concussion but did not suffer any injuries to his body and was discharged from Madinat Zayed hospital on Thursday. Yet, the UAE rider has no recollection of it and is grateful for Toby Price’s gesture in giving up his own title challenge to stop and wait for Al Balooshi to be airlifted to hospital before completing the third leg in 11th place. “Luckily, nothing is broken and I’m grateful for that,” Al Balooshi told Sport360, who hopes to be back on the bike in two weeks time and start preparations for the Baja Espana Aragon which will take place in July 21. “I thank God for that. I really don’t remember anything of the crash of how it happened. “I remember Toby Price stopping on the desert to help me and to be honest I didn’t know where I was. He added: “I saw on TV the spots of where I had the accident and then another spot of where I landed and I travelled quite far. That scared me. “I remember during the third stage that I was doing everything right and was gaining good minutes. Red Bull KTM rider Price finished the Abu Dhabi Desert Challenge in seventh place, with Chile’s Pablo Quintanilla taking the bikes title in Thursday’s final leg at Yas Marina Circuit. And Al Balooshi paid tribute to the Australian “legend” as well as the messages from the other riders. “My coach once said that good rider can not only be a good rider but has to be a good person and that is what Toby Price is,” he said. “He’s a real legend, he had a lot of patience because he asked and stopped and took time to be with me. He kept saying that everything will be okay. “He didn’t show that he was in a hurry. What he did was heroic and really respectful. I hope everyone including myself can learn from this legend as it was great sportsmanship. Toby Price came to the rescue of Emirati rider Mohammed Al Balooshi on Stage 3. Czech driver Martin Prokop retained his overall cars lead while Sam Sunderland made a big move towards a second successive bikes title, but it was Toby Price’s heartwarming gesture that stole the show on Day 3 of the Abu Dhabi Desert Challenge. The Australian motorcyclist came to the rescue of UAE rider Mohammed Al Balooshi, who was knocked unconscious following a crash near the end of the 281km Al Ain Water Stage and left stranded in the Liwa Desert. Red Bull KTM rider Price, 30, stopped and waited with Al Balooshi, who was airlifted to hospital, with Price going on to complete the third leg in 11th place in just over four hours, leaving him 35mins 51secs off the lead of stage winner and overall leader Sunderland. Price, who was crowned Desert Challenge and Dakar Rally champion in 2016, and is considered one of the world’s top cross country riders, holds little hope of catching Sunderland to claim a second win in the Emirates, but said that never entered his thinking when he came across his stricken colleague. “Rider safety is so important and I’d happily throw a race to make sure a rider is okay,” said the New South Wales native. “I had a good day but it was a bad day for him as right near the end he fell off his bike, so I stopped to make sure he was okay and waited for the helicopter to pick him up. 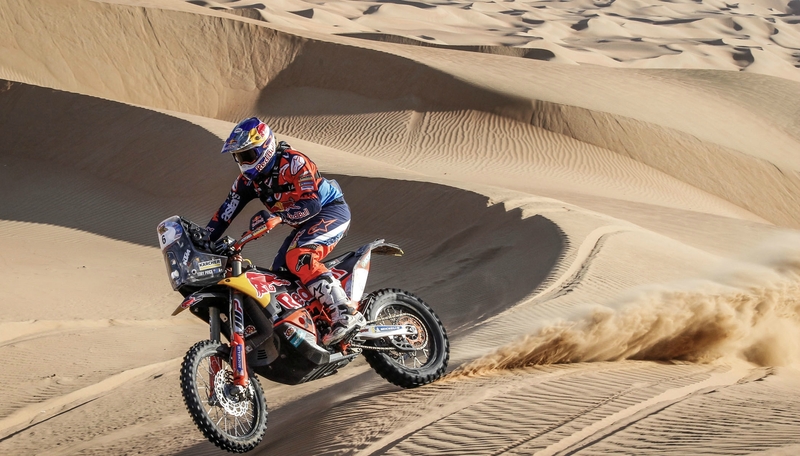 Sam Sunderland took a commanding lead in the Abu Dhabi Desert Challenge bikes category. Price crashed on the Nissan Stage on Day 2, coming home in 11th to effectively curtail his chances of glory. And the motocross veteran admitted accidents are a dangerous element of the sport that is not highlighted too much, due to the fact that when it does happen riders are often stranded without help, putting them in harmful situations. “It is a dangerous aspect of the sport,” he said. “We bikers are out there in the elements and alone, it’s not something mentioned often but when you come across someone laying on the ground you hope for the best. Al Balooshi, racing for his own Balooshi Racing KTM team, was transferred to Madinat Zayed Hospital and is being kept under observation for 24 hours. Although concussed, he has no other injuries. But he will not re-start the rally. Speaking from his hospital bed Al Balooshi paid tribute to Price, saying: “The day was going really well for me. Toby came by me before the refuel and the day got even better because I was happy to ride with somebody so fast. I was really honoured to be doing the stage with him. The recent Dubai International Baja winner was clearly shaken, but not seriously injured, adding: “He was there until I left the ground in the helicopter. He was talking to me all the time before the medics came, reassuring me. 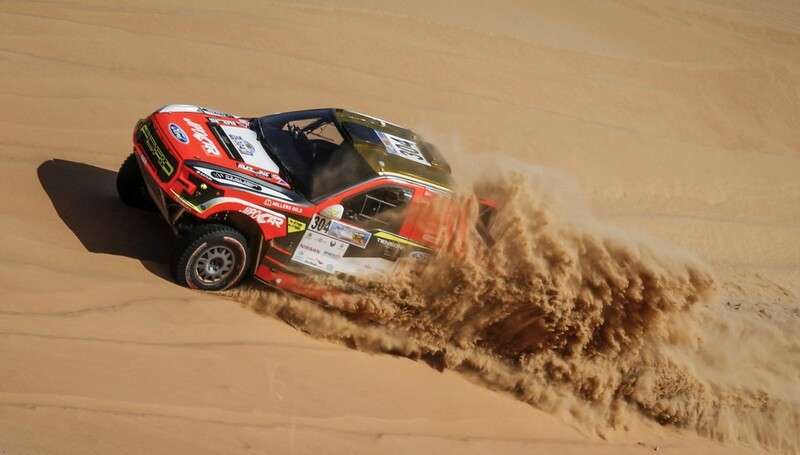 After gearbox problems ruined his prospects 24 hours earlier, Frenchman Alphand recovered to win the Al Ain Water Stage with 3mins 42secs to spare. Overnight leader Prokop was third fastest on the day to finish the leg with a reduced advantage of 8mins 40secs from Poland’s Jakub Przygonski, second quickest on the day. Martin Prokop holds a commanding lead in the cars section. The UAE’s defending champion Sheikh Khalid Al Qassimi suffered a major setback, losing 30 minutes because of a broken drive shaft. While he retained third place overall, he now lies more than 45 minutes off the lead. 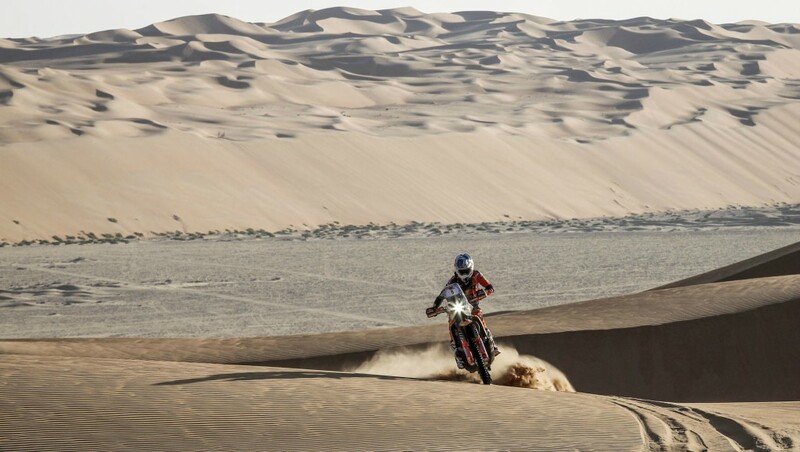 Dubai-based Sunderland, meanwhile, dominated on the bikes, winning the stage by just over six minutes from KTM team-mate Matthias Walkner to take a 7mins 34secs overall lead from the Austrian rider who succeeded him as Dakar Rally champion two months ago. Argentinian Kevin Benavides was third-fastest on the day to finish the leg another 2mins 14secs further adrift, just ahead of overnight leader Pablo Quintanilla in fourth. After a two-minute penalty had denied him the lead at the end of the first leg, Alphand had a dreadful time on Monday’s Nissan stage, plummeting down the field because of gearbox problems. From the start on Tuesday, however, the 2006 champion was flying across the dunes with all the style and confidence that made him the World Cup downhill skiing champion before he switched to motorsport in 1997. In the Bikes, Dubai-based Sam Sunderland dominated winning the stage by just over six minutes ahead of KTM team-mate Matthias Walkner to take the overall lead. In the battle of the bikes, Quintanilla clearly had a tough time opening the stage, and by the first checkpoint his 1min 8secs overnight lead had virtually been wiped out by Sunderland who immediately began pulling away. It was the most emphatic way to show that he has fully recovered after injuring his back in Peru while defending his Dakar Rally title in January. Kevin Benavides (ARG) / Honda CRF 450 10:45:07. Al Tareq Al Ameri believes Ferrari have sent out a strong message to their rivals following Sebastian Vettel’s Australian Grand Prix triumph and believes it will be good for the sport if he can regain his world title in Abu Dhabi. 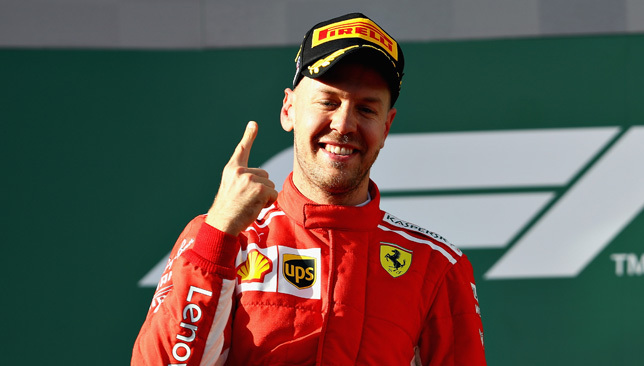 Vettel could not have asked for a more perfect start to 2018 with a dramatic victory in Melbourne on Sunday – the second successive year he has won Down Under. It appeared his chances of replicating his 2017 success were slim with world champion and Mercedes rival Lewis Hamilton in control of the race. But with Romain Grosjean stopping on the track which forced officials to impose a virtual safety-car, the Ferrari driver made the most of his pit-stop to leapfrog the Brit and cross the finish line first. Fans will be hoping this is just the start of what could be a fascinating title race after Hamilton clinched his fourth world championship with three races to spare last year. And Yas Marina Circuit CEO Al Ameri says Vettel’s win bodes well for the season ahead and hinted if he can claim his fifth world title, there could be a ‘big celebration’ in the UAE capital. Since Vettel won his last crown in 2013, Mercedes have been the dominant force on the track with Hamilton winning three of the last four titles (2013, 2014, 2015) and ex-driver Nico Rosberg triumphing in 2016. But Al Ameri fears F1 might go ‘stale’ if Hamilton and Mercedes continues their dominance in the future. “You need to see a different champion otherwise things will go stale,” he said. There’s still a long way to go before the elite drivers head to the capital in November but preparations are already underway for the season-finale. The November 23-25 event will be the 10th anniversary of the Abu Dhabi Grand Prix and Al Ameri says they have no issue in being the last race on the calendar. “We have transformed to what needs to be one of the last races on the calendar. We are fully 100 per cent behind it to make it work for us and I think for us and the stakeholders have achieved that,” he said.